Indian Air Force jobs has published Employment News for Multi Tasking Staff, Lower Division Clerk Posts. Interested and eligible candidates can have online application scheduled from 19-April-2018 Online can be registered online on the official site, all candidates are requested to submit all necessary employment related information before applying for this government job. Total numbers of vacancies are 145 Post. Only those candidates are eligible who have passed 12th Class or equivalent qualification from a recognised Board or University or A typing speed of 35 words per minute in English or 30 words per minute in Hindi on Computer. (35 words per minute & 30 words per minute correspond to 10500 Key Depressions Per Hour/9000 Key Depression per Hour on an Average of 5 Key depressions for each word. Indian citizen having age in between 18 to 27 years can apply for this Indian Air Force jobs Recruitment 2018. 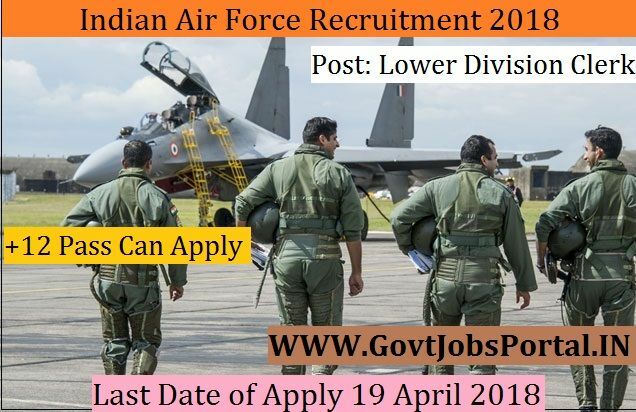 Those who are interested in these Indian Air Force and meet with the whole eligibility criteria related to these Indian Air Force jobs below in the same post. Read the whole article carefully before applying. Educational Criteria: Only those candidates are eligible who have passed 12th Class or equivalent qualification from a recognised Board or University or A typing speed of 35 words per minute in English or 30 words per minute in Hindi on Computer. (35 words per minute & 30 words per minute correspond to 10500 Key Depressions Per Hour/9000 Key Depression per Hour on an Average of 5 Key depressions for each word.